This video by the guitar pedal manufacuters Earthquake devices is particularly good. Featuring Money Mark (artist and famed Beastie Boys collaborator) in a laboratory with some created tools to make music. I enjoyed an essay by David Dobbs in Aeon Magazine about genes. Key to the argument is a call for more complex understanding of the relationship between genes and evolutionary change. The gene’s power to create traits, says Eisen, is just one of many evolutionary mechanisms. ‘Evolution is not even that simple. Anyone who’s worked on systems sees that natural selection takes advantage of the most bizarre aspects of biology. When something has so many parts, evolution will act on all of them. via Why it’s time to lay the selfish gene to rest – David Dobbs – Aeon. It seems to me that the arguments that the genetic code are read in different ways most challenges the notions about predictable genetic modification. There lies the quick beating heart of her argument: the gene follows. And one of the ways the gene follows is through this process called genetic accommodation. I appreciate that it comes down to a battle of articulation — simple vs. complex. Communication, it always comes back to communication. Some ideas corrode against others and in this case the gene-centric model pushes out the ability to explain that ideas like the selfish gene . . . might be a little more complex than we think. Yet West-Eberhard understands why many biologists stick to the gene-centric model. ‘It makes it easier to explain evolution,’ she says. ‘I’ve seen people who work in gene expression who understand all of this. But when they get asked about evolution, they go straight to Mendel. Because people understand it more easily.’ It’s easy to see why: even though life is a zillion bits of biology repeatedly rearranging themselves in a webwork of constantly modulated feedback loops, the selfish-gene model offers a step-by-step account as neat as a three-step flow chart. Gene, trait, phenotype, done. Science video blogger Emily Graslie has a crisp response to the nasty emails she receives. Graslie hosts her show the Brain Scoop. I like the performative readings of the emails themselves. Thanks Feministing for the link. In my desire to spend some more time doing funky cooking, I bought a little bag of xanthan gum. I’ve been thinking about making a sauce or gravy with it. Reading this little ketchup article (thanks Hairpin!) tied the ‘two-finger-tap’ to my new food additive. One interesting fact about ketchup that everyone should know is that it’s a non-Newtonian fluid. Naturally, ketchup is rather thin and watery, because the tomato pulp that gives it consistency is sieved out. As a result, commercial ketchup makers add a small amount of xanthan gum to their ketchup recipes to thicken it. But this ingredient has another side effect: It turns ketchup into a shear thinning fluid. In other words, how quickly ketchup flows depends upon the stress that is being placed upon it. via How 500 Years Of Weird Condiment History Designed The Heinz Ketchup Bottle | Co.Design: business + innovation + design. That ketchup is non-Newtonian is the main reason why getting it out of a glass bottle is so slow. Allowed to flow naturally, ketchup only travels at a speed of 147 feet per hour. The only way to speed it up is to apply force, which through the principle of shear thinning decreases the ketchup’s viscosity, and thus increases its flow rate. This is why you have to thump a bottle of ketchup to get it flowing from the bottle. The concussive force makes it flow faster. But despite common opinion, the bottom of a bottle of Heinz Ketchup isn’t actually the best place to thump it. If you apply force to the bottom of a bottle of Heinz, the ketchup closest to where you smacked will absorb most of the force of impact. It will flow freely, but the ketchup that is viscously clogging the neck and mouth of the bottle won’t, leaving you no better off than you were before. The solution is to trigger the shear thinning effect at the top of the bottle, not the bottom. That unclogs the mouth and lets the ketchup below to freely flow. So while the substance of Heinz’s “57 Varieties” label may be just a fanciful whim on the part of the company’s creator, its positioning is deliberate. It’s a target. By simply tapping the label with two fingers, you create the optimal conditions for shear thinning, transforming non-Newtonian ketchup into a free-flowing liquid. Physics! Tagged as history of ketchup, ketchup, ketchup and flow, ketchup and xanthan gum, molecular gastronomy, physics of ketchup, why the two finger tap for ketchup? Today, MSG is manufactured commercially by fermentation that is more or less the same as what’s happening in the Momofuku R&D lab. In factories around the world, a bacterium known as Corynebacterium glutamicum (so named for its prized waste products) is fed plant glucose (corn, beets, wheat). As it eats, it releases glutamic acid. The resulting fermented product is filtered and centrifuged to isolate the glutamic acid and remove by-products and impurities, it’s crystallized, and out comes MSG. via The Notorious MSG’s Unlikely Formula For Success. Felicia the ferret. Image taken from Fermilab. Scientific knowledge comes from inquiry into the natural world. It is a valuable and important part of human existence. As we learn and invent, it is equally important that we constantly reflect on how we do science — it is just as important to refine — to do science better. I believe that using animals for experimentation is unethical. 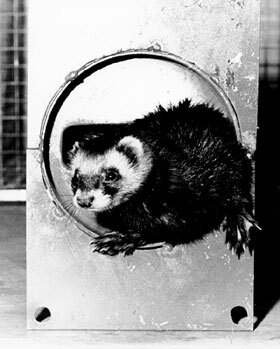 I have a brief pause, reading the old articles about Felicia the ferret, who helped to clean the tubes at the National Accelerator Laboratory in Illinois. There is something sweet about Felicia’s work that belies my understanding of animals in research laboratories. Here are a few examination of the 1971 newspaper descriptions of this ferret used for science. It seems as though each article describes the natural skills that make Felicia the ferret particularly capable of the tasks she is given (running a string through 300 foot tubes). David Anderson’s article highlights the role of Robert Sheldon, the scientist who suggested that the lab try a ferret. Being British, Sheldon remembered the use of ferrets by poachers who sent them into burrows after rabbits on English estates. Gamekeepers could hear the shooting of guns, but never the silent ferrets. via Fermilab History and Archives Project | Natural History – Wildlife – Felicia Ferret. It is one of those success stories you read about: A small-town girl fresh off the farm finds fame and fortune. Well, Felicia, who spent her early years on the farm of Stan Fredin near Gaylord, Minn., isn’t the average Minnesota farm girl. In the first place, her hair is three different colors – brown, white and black. Also, she is small as Minnesota girls go, barely topping 4 inches when on all fours. Felicia is a ferret and left Fredin’s farm early this summer for a job with the National Accelerator Laboratory in Batavia, IL. Several of the articles suggest that Felicia be rewarded with a mate — each time the suggestion was denied because if she became pregnant she might not fit through the small holes she was being trained to run through. She has her own special set of weight watchers, including Sheldon, who just doesn’t intend to let her get too big for the job. 3. Memorializing Felicia to justify the use of animals in science. Many of representations in these four articles are justifications for breeding, enslaving and using an animal for someone’s gain. Part of the problem is that Felicia is a particular case — her work didn’t involve being cut open or enduring a painful series of experimental drugs. Everyone can be sold the bogus particular story of a cute rodent running through the tubes bravely helping the scientists. Contrast that to the 13 million animals being used in research. The American Anti-Vivisection Society note that most of the test subjects are mice, rats and other rodents . . . like cute little Felicia! Though the scientific value and ethics of animal research are increasingly being questioned, it is estimated that over 13 million animals are still being used in a wide variety of research projects every year in the United States. Purpose-bred birds, rats, and mice, as well as fish and other cold-blooded animals, make up the vast majority of the animals used in research (over 90 percent), yet are specifically excluded from the Animal Welfare Act. As a result, the U.S. Department of Agriculture (USDA) does not keep records of the use of these animals, nor is there any legal requirement to afford these animals even the minimal standards of care provided by the Animal Welfare Act. via Animals Used in Research – The American Anti-Vivisection Society (AAVS). Which makes the particularizing and justifying of this individual animal’s story so worthy of amplification. Kathryn Winslow’s plaintive profile of the ferret is a pretty stark contrast to the usual life of a ferret in a research laboratory. Felicia turned out to be a virtuoso at her work. She carried whatever was fastened to her harness for long distances, sometimes around many obstacles on the course. Those working with her were so pleased that they wanted to reward her at the open end of her journey, but they could not find a tidbit she particularly longed for. She was happy enough to see her cage at the end of the journey, the only lure that was ever used to bring her out at the other end. She was soon famous. She has been talked about on radio, seen on television numerous times, and been written up in magazines and newspapers with national and international coverage. She stars in a television film to be released soon in Europe. Her personal “manager” at the laboratory is Walter Pelczarski, who lives in Clarendon Hills. This particular article notes that Felicia became famous for her participation in the cleaning of the tubes — an animal celebrity. Why would this ferret get it’s own movie? From an anthropocentric perspective this cute furry animal that solves a little problem in this giant scientific endeavor grounds the abstract science in a narrative that is comfortable. Felicia didn’t want to go through those tubes, she was bred and raised particularly for this task. She was trained and rewarded, and of course kept in a cage for most of her life. This good life may soon end for Felicia. The laboratory scientists have designed and built a mechanical ferret, a device activated by compressed air and controlled by wires. They don’t need Felicia anymore. This was always the plan, with Felicia to be used only temporarily, while they built her robot. But now Felicia is famous and she has a following of people concerned for her welfare; people who do not want to see her sent to a museum as an exhibit, which is what the laboratory may do with her two weeks from now. They are thinking of sending her to Oak Ridge, Tenn., where there is a live museum of animals and creatures that have made a contribution to science. There are mice, guinea pigs, and snakes there, among other exhibits. But it’s no place for Felicia, who is a pet and needs the affection of human beings. Will it take an act of Congress to save Felicia? Here is to an act of congress that frees all animals in captivity being used for experimentation. If it’s good enough for Felicia, I bet it’s good enough for the ferret getting injected with Influenza virus down the road. About two weeks ago, I was recommended the Science Seeker blog awards for quality science writing. I did what most internet-savvy people do — scan and skim. I looked down the list of nominees to see if there was something that interested me personally and then checked out to see if the writing was quality. So I checked out one of their suggestions, a finalist for the award in writing on Neuroscience. I opened up the Neurocritic’s article pondering whether a pioneer in gay-aversion therapy should win awards in the discipline. I’ve been thinking about accountability in the social sciences for some of the consequences of labeling-in-the-name-of-academics, so I’m intrigued by this article. Should we question the judgment of APS in honoring Dr. Barlow with the Cattell Award? 2 Are they tacitly condoning exorcism in transsexuals (Barlow et al., 1977) and aversion therapy in gay men (Barlow et al., 1969; Hayes et al., 1983)? At the very least, APS did not publicly acknowledge or condemn these former practices, which remain secretly buried in the past. via The Neurocritic: Dr. David H. Barlow and Aversion Therapy for Gays. I happen to agree with Doctor Conway, but the article was well-written and fundamentally journalistic. It was worthy of being nominated for an award and deserves to be more broadly read. So back to the Science Seekers to see if the rest of their recommendations were as good. I was astounded. Story after story, the panel had uncovered a great collection of investigations and writings about science. Almost no junk. No wasted time, just thick idea after informed idea. “Wolfe, these things aren’t even bacteria.” When I read that sentence, a chill ran up my spine. Only a few people on Earth ever get to experience a kind of veil-lifting moment of that magnitude — Einstein, Newton, Kepler, etc., come to mind — but humble Carl Woese was another. He had stumbled on a brave new world of microbes that looked like bacteria to our eyes, but were in fact so unique biochemically and physically that they have ultimately proved to be more closely related to us than to them. He had stumbled on an entirely new form of life, right here on Earth. via Archaea Are More Wonderful Than You Know | The Artful Amoeba, Scientific American Blog Network. I spent a couple of days watching old BBC documentaries on color and perception after reading the Empirical Zeal’s pair of posts about the relationship between language and understanding of color. The researchers discovered that, compared to the Tarahumara, English speakers do indeed see blue and green as more distinct. Having a word for blue seems to make the color ‘pop’ a little more in our minds. But it was a fragile effect, and any verbal distraction would make it disappear. The implication is that language may affect how we see the world. Somehow, the linguistic distinction between blue and green may heighten the perceived difference between them. Smells like Whorf’s idea to me. via The crayola-fication of the world: How we gave colors names, and it messed with our brains (part II) | Empirical Zeal. Of course humans have to get-all-reflective when other primates show new patterns of learning, such as the Rwandan mountain gorillas who seem to be teaching each other how to dismantle poacher’s snares. The Dian Fossey Gorilla Fund hailed the gorillas’ accomplishment because this was the first time researchers had witnessed snare-removal by young gorillas. In past, only mature gorillas (usually silverbacks) had been observed disabling snares. That’s exciting because it implies that the young gorillas are learning from the older ones. But I was intrigued by the whole event. Read it again. According to Ndayambaje, the silverback warned him away from the snare and then three other gorillas worked together to remove it – conceivably to protect Ndayambaje, or at least the other gorillas. Is this possible? Can mountain gorillas really act with that kind of intent? Are they really that smart? via Endless Forms Most Beautiful » Blog Archive » Exploring the Mind of the Mountain Gorilla. Carl Zimmer’s National Geographic article: “When you swallow a grenade” clarified the impact of antibiotics on healthy bacteria. I found it a great contribution to the current discussions about our microbiomes. I read and enjoyed almost a dozen of the suggestions from the Science Seeker. They certainly should be re-blogged and shared. Don’t stop learning!